Hold the scanner to scan the following QR code. You will automatically be taken to the White & Case official account. 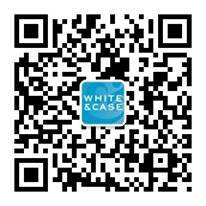 You can now access the White & Case account under Subscriptions (订阅号) and receive alerts on any incoming content. 1. Download the WeChat app from the App Store or Google Play. 2. When you have set up an account, select 'Discover' from within the app. 3. Select 'Scan QR code' and scan the image below.